I don’t have anything in or out (that I’m counting). Kelli and I finished up all of our deadline quilts but I don’t count them until they are back at my house and revealed to all of you. I did stop at Goodwill to check the fabric bins…it is my favorite store for fabric. I didn’t find fabric but I did find this. It’s an old beat up quilt top. It was in a bag with another quilt top. That one was just big squares made of upholstery material. It was $5 for the pair. I didn’t want the other one…but this one, I kind of liked. It’s not beautiful..but I love the block. Do any of you know if the block has a name?? 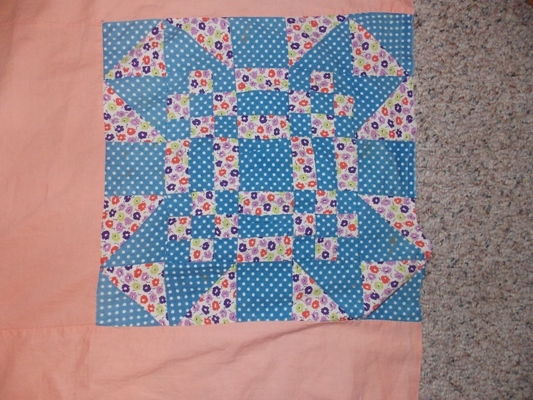 I am sure that sometime, someday, Kelli and will use this block for something. We both just really like it. I don’t know about actually salvaging the top. There are holes. It’s in the seam but even the fabric feels a little thin. I’ll have to look at it closer. I’m not a fan of the setting. The sashing is too wide. For now, it’s going in a to-do pile. Sometime when we jump in the car on a trip, I’ll grab it and rip the top apart while we travel in the car. We are hosting a Labor Day Weekend Set a Goal party with a giveaway incentive here.…and we have a usual Try it on Tuesday post that we have a giveaway going on with as well. It’s just some fun things you might want to try out. To see more stash reports, check out Patchwork Times. 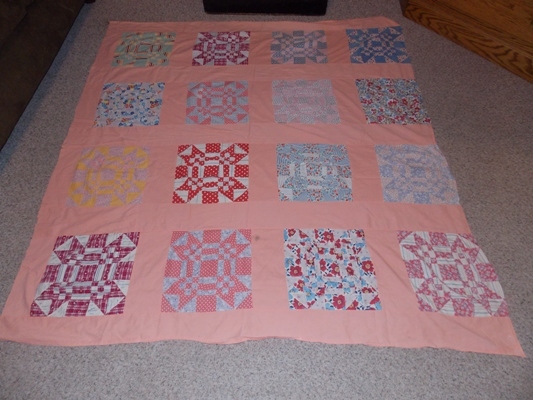 This entry was posted in Quilting, Stash Report on September 1, 2013 by Jo. maybe it’s a variation of ‘moth in the window’ block; sort of what 4 blocks would look like if morphed together. after studying it some more, the center of the block is closer to “Goose in the Pond”, but the 3 outside HST’s are turned differently, to look more like a “Moth in the Window” block. facinating find! Missouri Puzzle is the name of this block. It’s one of my favorites. 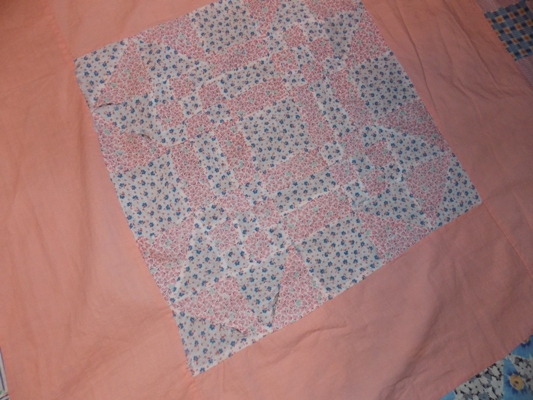 It can be found in Barbara Brackman’s Encyclopedia of Pieced Quilt Patterns. It’s on page 231 plate #1817a. It’s also called New Mexico or Mexican Block. Great find at Goodwill. I’m anxious to see what you do with the top. Lovely blocks. I agree that it looks like “Good in the Pond” with a variation on the outside HST’s. I would take it apart and combine the blocks with a new sashing. I love these blocks too! Barbara Brackman’s encyclopedia calls the block New Mexico, Mexican Block or The Missouri Puzzle. great find!